In my quest to complete the Hike366 project with as many novel hikes as possible, I searched for something new to do at the Oregon Coast. Beverley Beach checked all the boxes: it was close enough to Corvallis, it was short enough to do in a couple hours and it looked intriguing to me. On this warm and sunny day I made the trek to the coast. First stop: Marine Gardens. 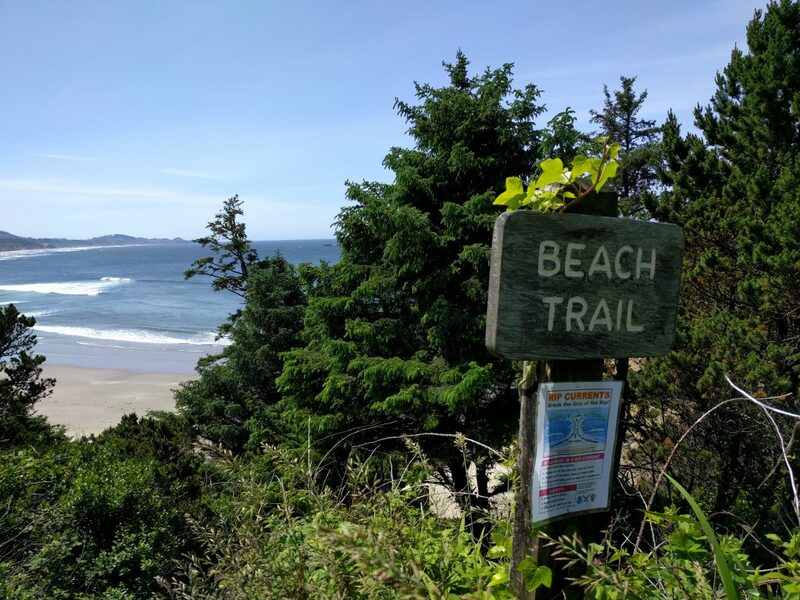 From the parking area at Otter Crest, I found the steep pathway down to the beach. Here there were far more birds than people, which I enjoyed. I wandered around among the shoreline rocks, admiring the interesting shapes, colors and textures. But I wasn’t here for tidepooling today, so I didn’t hang around too long. 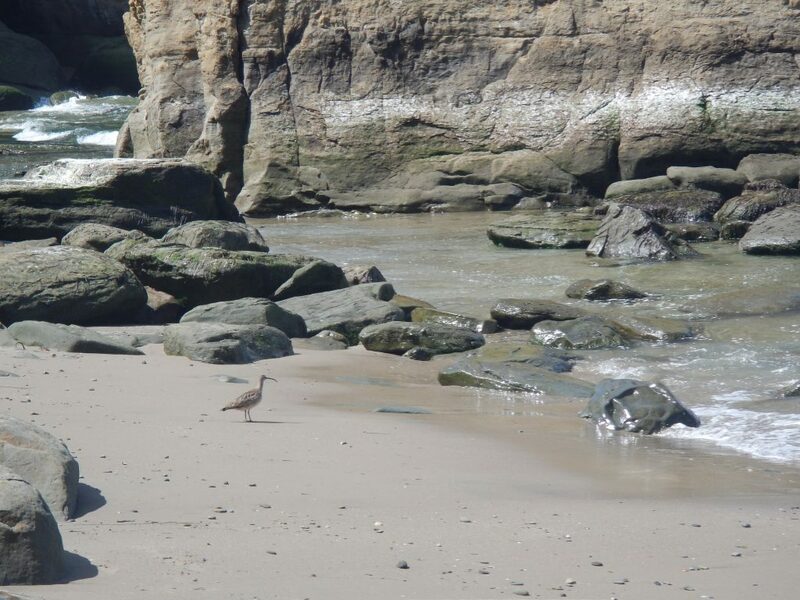 I said goodbye to my avian friends and scurried back uphill to find the beach trail. A steep staircase led down to Beverley Beach. This wide swath of sand stretched 1.5 miles to another trailhead at a state park and camping area. That would roughly be my turn-around point so that I could get back home before my evening obligations. I took off my shoes and started walking. The weather was nice. Pleasant really. The salty sea breeze brushed past my nostrils as I strode across the firm sand. The water twinkled in the sunshine. One one side, the waves swirled and crashed into shore. 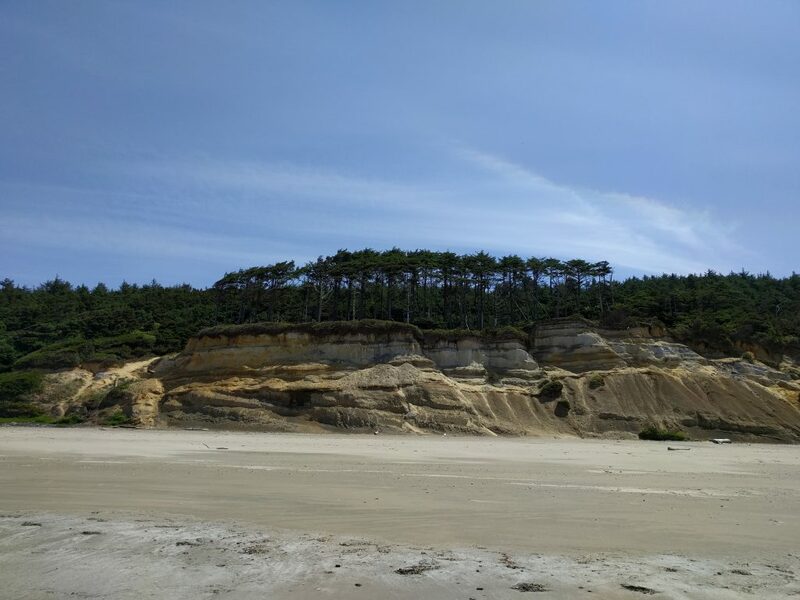 On the other side, coastal trees grew close together, creating a green fortress above the striped sea cliffs. It was like walking through a painting. And hardly a soul in sight, fantastic! I passed the 1.5 mile mark and just kept walking. How could I not? It was such a perfect beach day! Gulls swooped overhead. Thin clouds streaked across the sky. Sand grains squished underneath my feet. And I had the whole world in front of me. Surely nothing could be so glorious. When I hit my turnaround time I took a sip of water, looked around and turned towards the parking area. But wait. That gentle sea breeze at my back now felt like hurricane-force wind blasting at my face. This couldn’t be! Each step was agonizingly more difficult than the one before. Ack! I’d never make it back in time now. I was moving slowly, getting really cold and feeling every exposed patch of skin become abraded by flying sand. Oh this was the worst. After what felt like an endless death march the stairs leading off of the beach came into view. I lunged at them in order to get myself out of this maelstrom. I’d never felt so caught off-guard before! I almost didn’t have enough layers to stay warm and I swore I’d never be so silly as to wear shorts to the Oregon coast again. That lesson learned, I got to my car, wiped off my feet and grabbed a cup of chowder at Mo’s to warm myself up before heading home. What a day at the beach! 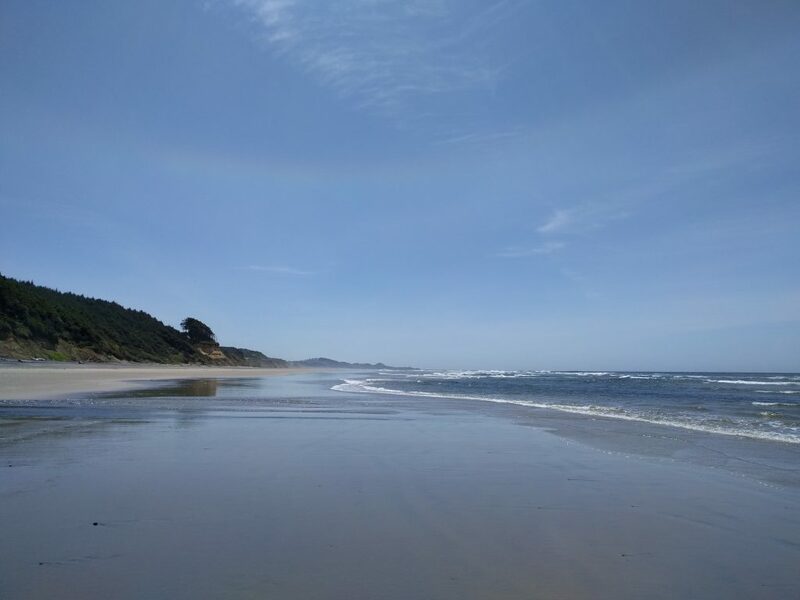 This entry was posted in Hiking, Oregon and tagged hike366 on May 18, 2016 by Jess B.